James Barry in Berkshire Theatre Festival’s Unicorn Theatre production of The Caretaker. Photo by Kevin Sprague. Tommy Schrider and Jonathan Epstein in Berkshire Theatre Festival’s Unicorn Theatre production of The Caretaker. Photo by Kevin Sprague. 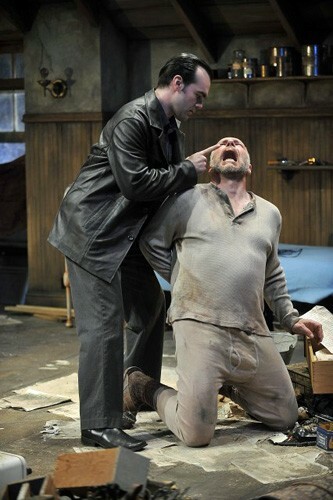 James Barry and Jonathan Epstein in Berkshire Theatre Festival’s Unicorn Theatre production of The Caretaker. Photo by Kevin Sprague. 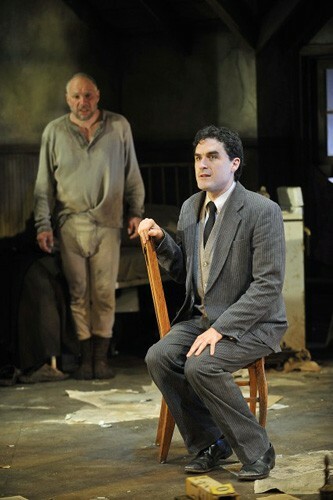 Jonathan Epstein and James Barry in Berkshire Theatre Festival’s Unicorn Theatre production of The Caretaker. Photo by Kevin Sprague. 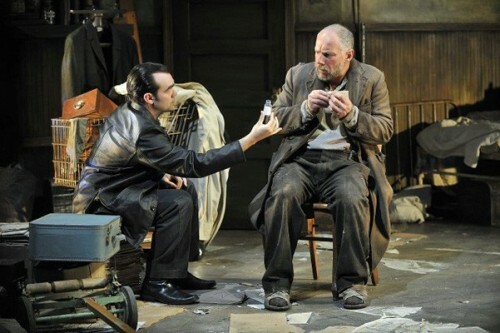 Jonathan Epstein, Tommy Schrider, and James Barry in Berkshire Theatre Festival’s Unicorn Theatre production of The Caretaker. Photo by Kevin Sprague. 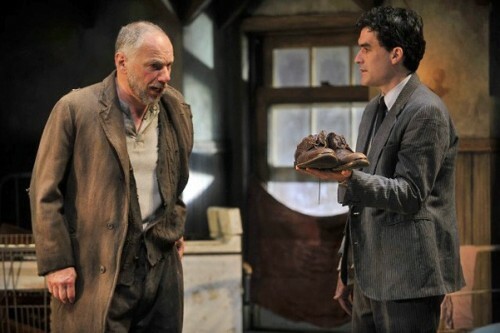 Jonathan Epstein and Tommy Schrider in Berkshire Theatre Festival’s Unicorn Theatre production of The Caretaker. Photo by Kevin Sprague. Written by Harold Pinter, Directed by Eric Hill, with James Barry as Mick, Tommy Schrider as Aston, Jonathan Epstein as Davies. Stage Manager, Stephen Horton, Scenic Designer Jonathan Wentz, Costume Designer, Yoshinori Tanokura, Lighting Designer, Matthew E. Adelson, Composer/Sound Designer, J Hagenbuckle, Resident Dialect Coach, David Alan Stern, Casting Director, Alan Filderman. Playing now through June 28th. Once again the Berkshire Theatre Festival has lived up to its reputation of mounting stirring productions of classic theater. The opening production in the Unicorn Theatre is proof that Kate Maguire and her team have not lost their magic. This difficult work is a success on just about every level. Still, if you are not familiar with Harold Pinter, it should be noted that the action, so to speak, is largely in the subtext. Pinter examines the human condition as few others can. The heart of the play is not so much in the dialogue as in the silences. And that is as it should be. The endless discussions about shoes, sheds and Sidcup are just verbal filagrees around the otherwise empty lives of two brothers and a tramp. In Pinter's works, an actor has to count beats of silence as carefully as he remembers his lines. The brothers, Mick and Aston, are barely able to communicate with each other. There is little love between them nor in their lives. We first meet Aston sitting on the edge of his bed, staring into space, a stranger in his own bedroom. The portrayal by Tommy Schrider is very low key. When he offers Davies, the tramp, a place to stay until he gets "sorted out" the kindness in the gesture is missing. The lack of human warmth is downright frightening. Later, when his brother Mick arrives, well played by a volcanic James Barry, we do not doubt that the danger is real as he erupts like a volcano. Then he has an abrupt mood change and becomes surprisingly friendly. Which is the real Mick? In the best role of his long acting career, Jonathan Epstein's portrayal of the homeless man Davies is a triumph. At moments a whimpering fool, he is also a thieving opportunist, demanding gentleman, and threatening intruder. He snarls. He whimpers. He is a people pleaser and a conniver. None of the characters are what they seem. The plot, what there is of it, is fairly simple. The tramp arrives, he stays, he manipulates, he leaves. In the final moments, we come to realize that nothing has really changed. 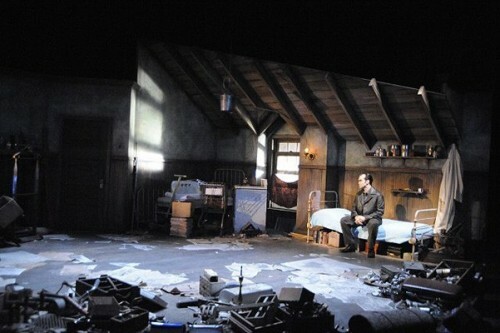 The Caretaker was Harold Pinter's first commercial hit on the London stage, in 1960, and revealed his talent for portraying the emptiness of post-war London, especially the kind taking place under the rafters of a derelict London flat. So what can we say about the Berkshire Theatre Festival's production of this classic drama which opens their 80th Season? Only that after almost 50 years this play still has the simultaneous power to enlighten and repel. The two brothers and the tramp consistently fail to communicate with one another, then fall into long silences which are punctuated with fear and despair. Director Eric Hill has done a masterful job of creating dramatic tension on stage out of simple pauses and dialog that is often delivered at the top of Mick's voice, or mumbled sotto voce by the stranger his brother has brought home. Along the perimeter of the stage are piles of other castoff items that Aston has rescued over the years. He collects junk and the tramp is just another item in his collection. The setting for this play was designed by Jonathan Wentz and deserves an award for his almost "method" set design. To be truly method, the newspapers on the floor would have to be loose, not glued down. Safety first. Still this sort of set is my favorite kind. There's a bucket that hangs from the ceiling to catch drips when it rains. There's a rolled up rug, newspapers scattered about, boxes of junk, a bathroom sink, and a broken gas stove with a statue of the Buddha on top of it. As the curtain rises the second bed is hidden under another pile of castoffs, and clearly the occupants of the room care little about their surroundings. 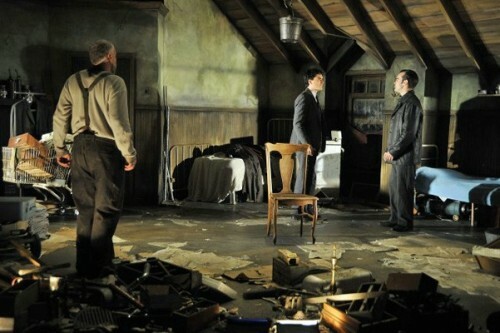 The lighting of the set, while dramatic, has problems. The sun comes in at such a unnatural low angle that the earth and intervening buildings would seem to have become transparent. Some of the fresnels and other lights needed barn doors to prevent light from washing beyond the stage. 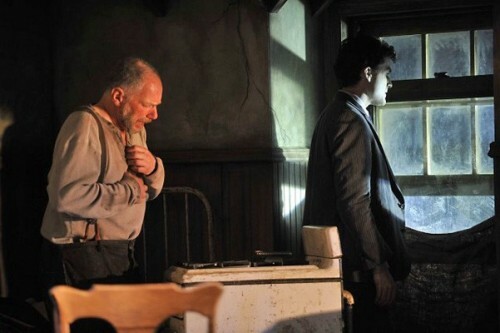 Towards the end of Act One, as Aston relates his own experiences in a mental hospital, the light seems to fade as Tommy Schrider's voice drops into a near mumble. The combination of the two is certainly effective in portraying the emptiness and futility of Aston's life, but it also lull the audience into a hypnotic state. Briefly, it made one wonder whether returning for the second act would be worth it. I noticed half a dozen empty seats near me after the intermission. Director Eric Hill wisely did away with the traditional three acts and two intermissions of the play, while speeding up the pacing somewhat for an American audience. A good thing in our new short-attention-span world. 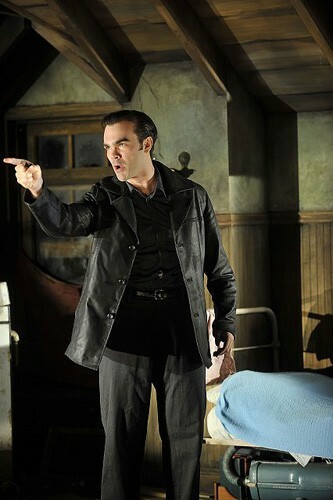 In the second half of the play Mick offers Davies a job as a caretaker. This is a key moment, encouraging the wily outsider to play up to both brothers. But his manipulations backfire, and eventually he finds himself once again on the road to nowhere. Harold Pinter clearly found inspiration in Samuel Beckett's Waiting for Godot which BTF plans to stage in August. Back in Pinterland, Aston offers Davies new shoes twice. The first time he rejects them as the wrong size, the second time he reluctantly accepts them, even with non-matching laces. The costumes by Yoshinori Tanokura were appropriate to the period, and Davies' ragged and stained ensemble was truly stunning in its repulsiveness. You have to wonder what Aston was thinking when he brought home such a repellant stranger. Davies barely washed and both brothers complained that he "stinked up the place." Perhaps their loneliness and isolation was that deep and desperate. Playing at the Berjshire Theatre F'estival's Unicorn Theatre now through June 28th. Box Office (413) 298-5576.